This town's not big enough for two basketball teams, but we have two anyway. 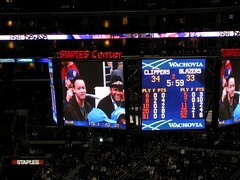 I went to the Clippers-Blazers game and the Lakers-Bobcats game this week. Let's compare. Clippers: Cheesy montage video encouraging Clippers to "play loud," whatever that means. Not worth capturing. 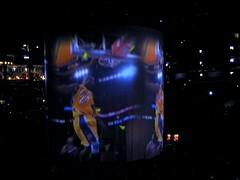 Lakers: Cheesy montage video projected onto a cylindrical screen. Winner: Lakers. Their montage actually had triumphant moments. 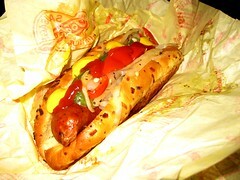 Clippers: Free food in the CIA's suite. Winner: Clippers. It was free and unlimited, and there was dessert. 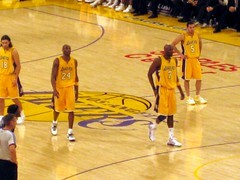 Lakers: The usual men. Not worth capturing. 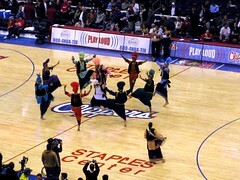 Clippers: Two words -- Clipper strippers. Not worth capturing. 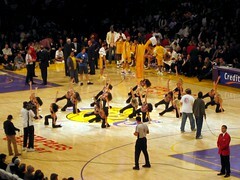 Lakers: I love Laker Girls! So in-sync, so talented, so awesome! 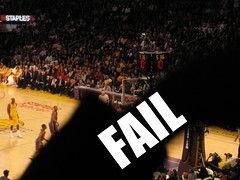 Lakers: Lame audience contests. Not worth capturing. 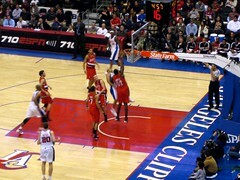 Clippers: Christopher Reid. Who is that? Imagine him with a really tall flat top. It's Kid from Kid 'n' Play! Lakers: Jack Nicholson. Too far to capture. Winner: Lakers. Sorry, Kid. Jack trumps all, even when unphotographed. Clippers: Not much to say here. Poor poor Clippers. 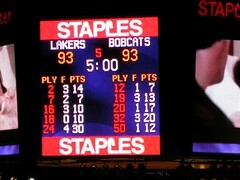 Lakers: Amaaaaazing. So exciting! Double overtime! 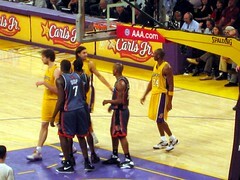 Kobe fouled out! Winner: Lakers. They may have lost this game, but, man, was it awesome. 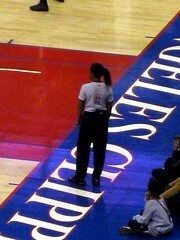 Clippers: My co-workers! 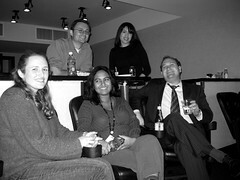 Lots of fun chillin' in the suite. Lakers: Amber! 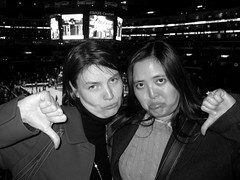 We were sad that the Lakers lost. 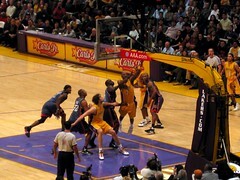 Lakers! 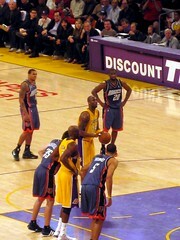 Lakers! There's a reason why everybody in this city loves the Lakers. 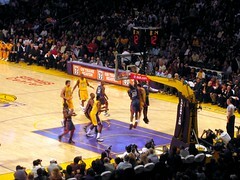 Unlike people at Clipper games, Laker fans actually jump up and cheer! Great for morale and spirit. Not so great for pictures. Special thanks to Amber for letting me be her substitute husband for the night! i want to go to games with you. Looks like the CIA has quite the spread! I love the pic of our CIA buddies--wish I could go to an event with you guys. Also love your "FAIL" pic cause I have soooooo many of those--especially when I try to take shots from far away with my zoom. Someone ALWAYS gets in the way! I feel so sorry for the Clippers. It's like they're the Quarterback's dorky younger brother who wins the science fair and gets shoved in his locker every afternoon. love the comparisons. fun you were able to meet up with amber! Love this post. Love the comparison. I almost feel bad for the Clippers . 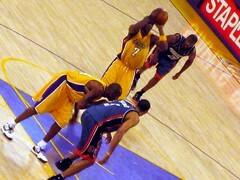 . . but then again, I never understood why LA had two teams anyway. this post was kinda profound. i think k would love it. Funny. 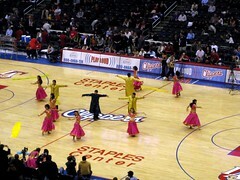 Now if the Clippers were winning would they be loved like the Lakers? I think even a WNBA game would be fun with you! i had such a fun night, not withstanding the loss. ;) thanks for being an awesome stand-in for jim! 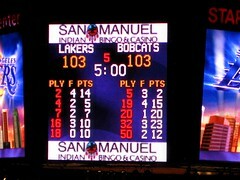 lakers killed it on this road trip --- 6 for 6 baby! !